It is abundantly clear that there are patients whose clinical presentation and paraclinical findings do not, at least initially, make for a clear diagnosis. Moreover, some diseases, like myocarditis, can have a very polymorphous set of symptoms and laboratory results, while other diseases, like myocardial bridging, lack in clear-cut guidelines. As a result the decision on the best management of disease is based both on obtaining all the necessary elements of the diagnostic puzzle, on individual experience and the best available evidencebased medicine. The present case is a good example of these difficulties and was interesting because of the real-time evolution of the diagnostic probability. We present the case of a 19-year-old patient who was brought to the emergency room of the local hospital during the night for an episode of chest pain that lasted for about 2 hours during the morning, which recurred in the evening, though of lesser intensity and duration. Smoking was his only cardiovascular risk factor and before this he had no notable disease or lifestyle history. At presentation, the physical exam showed moderately good general status, a blood pressure of 110/60 mmHg, normal lung examination and normal heart auscultation. There was no recent history of fever, respiratory tract infection or diarrhea. The ECG at presentation (Figure 1) showed sinus rhythm, R/S >1 in V1, small ST segment elevation and high voltage T waves in leads V2-V5. Figure 1. ECG: Sinus rhythm 120/min, R/S >1 in V1, high voltage T waves in leads V2-V5. The laboratory workup showed elevated troponin (3.26 ng/ml), CK-MB (56.6 ng/ml) and AST (95 U/L); also moderately high levels of C-reactive protein (1.27 mg/L). The echocardiography (Figure 2) showed normal heart morphology and function, except for a small pericardial effusion (maximum of 3 mm lateral of the left ventricle) (Figure 2A). Figure 2. Echocardiography A. Apical four-chamber view with a small amount of pericardial eff usion lateral to the left ventricle (arrow). B. Automated function imaging of the left ventricle with normal global systolic deformation. Moreover, when subclinical LV dysfunction was verified, there was a normal global LV strain without regional dysfunction (Figure 2B). During his hospital stay he was treated as an acute coronary syndrome with nadroparine, aspirin, beta blocker, NSAIDs and H2-receptor antagonist with good clinical evolution and no recurring chest pain. He was transferred to our clinic for further investigations. At the time of the transfer the necrosis enzyme levels had normalized, the ECG aspect remained the same and no pericardial effusion was visible on the echocardiography. Figure 3. Coronarography: A. Left coronary artery during diastole, with no visible lesions. B. Left coronary artery during systole, with myocardial bridge (arrows) in LAD II, resulting in a 70-80% stenosis. At local hospital discharge, there remained to determine the final diagnosis with a differential between myocarditis and myocardial infarction in a young patient. There were reasons for and against both of the diagnoses: the acute thoracic pain, high troponin levels and R/S >1 aspect in V1 pleaded for inferior myocardial infarction, while the age of the patient, the pericardial effusion and the infl ammatory syndrome were all suggestive for myocarditis. With the purpose of determining a final diagnosis we decided on a series of investigations: First, after normal present clinical exam, echocardiographic aspect and laboratory workup, the patient underwent a coronary angiography, which showed no atherosclerotic lesions, but a myocardial bridge on LAD segment II with 80% stenosis during systole (Figure 3). This finding raised the idea that myocardial ischemia was a possible diagnosis. In order to determine the importance of myocardial ischemia, the patienthad an echocardiographic stress test, which was submaximal (max HR=82% of the predicted maximum), but negative clinically, echocardiographically and on the ECG. This development again put doubt on the ischemic hypothesis. In order to further describe myocardial structural and functional changes, the patient underwent cardiac magnetic resonance (CMR) (Figure 4), which showed normal left ventricle volume and systolic function, with myocardial hypersignal areas in the T2 sequence, with a ratio greater than 2 compared to skeletal muscle, which suggest the presence of edema areas. After the administration of contrast substance, during late enhancement, there was a finding of spotted medioparietal contrast intake with evolution toward the epicardium. It also showed circumferential pericardial eff usion of a maximum thickness of 6 mm. The radiologist’s interpretation was that the aspect is highly suggestive for acute myopericarditis, with the location of the lesions being suggestive of infection with B19 parvovirus. Figure 4. Cardiac magnetic resonance: Panels A and B demonstrate good systolic LV function. Panel C shows myocardial hypersignal areas in the T2 sequence. Panels D and E demonstrate diffuse late medioparietal contrast intake. To sum up, this is the case of a young patient with symptoms and paraclinical fi ndings which placed the possible diagnosis between acute coronary syndrome and myocarditis. The development of the diagnosis in real-time was very interesting, with data inclining the balance towards each of the two possibilities: after coronary angiography we were highly inclined toward having a final diagnosis of acute coronary syndrome on the basis of a symptomatic myocardial bridge, but after completing the CMR, 2 days later, myocarditis became a certain diagnosis, with the myocardial bridge remaining probably just an incidental finding. What remained to be determined was the appropriate treatment. For the moment, we considered that there was no treatment needed for the myocarditis, because the episode was thought to be an acute one with no objective or subjective long-term damage, the patient being advised to undergo another CMR investigation in 6 months’ time, to evaluate any progression of the lesions or pericardial eff usion. As for the myocardial bridge, the treatment consists of beta-blocker medication, with no interventional or surgical treatment for the present time, the bridge being considered an incidental finding. However, the patient will still need periodic clinical evaluation along with stress echocardiography, to help determine on the opportunity of further treatment, surgical or otherwise. The present case reflects in a very practical manner the diagnostic difficulties in acute myocarditis, due to the polymorphic clinical, laboratory and imaging picture. Myocarditis is defined by WHO/ISFC as an inflammatory disease which envelops histological (Dallas criteria), immunological and immunohistochemical criteria (1). However, most of the patients with clinical manifestations of myocarditis do not undergo endomyocardial biopsy (EMB), exam which can confirm a diagnosis otherwise uncertain for these criteria. Although in many cases the etiology remains undetermined (2), the most common cause in developed countries is viral infection (3), with the possibility of bacterial, fungal, parasitic, toxic (radiation) and immunologic causes (2). Even though EMB remains the gold standard, it is not used on clinically stable patients, which is the reason that the European Society of Cardiology Working Group on Myocardial and Pericardial Diseases launched new diagnostic criteria in 2013.
syndrome (e.g. valve disease, congenital heart disease, hyperthyroidism, etc. Suspicion is higher with higher number of fulfi lled criteria. Legend: aIf the patient is asymptomatic ≥2 diagnostic criteria should be met. Clinical manifestations are highly variable, ranging from mild symptoms (fatigue, chest pain) to heart failure and life threatening conditions (ventricular arrhythmias, cardiogenic shock and even sudden death) (2,4-6) (Table 1). Myocarditis is more frequent in young people, even though all age groups can be aff ected. Because of the large diversity of clinical manifestations, clinical practitioners should have a high level of suspicion with the earliest onset of symptoms and use all the appropriate investigations for quickly determining a correct diagnosis. In all situations of suspected myocarditis, especially in cases of acute coronary syndrome-like symptoms (as is the case with our patient) it is mandatory to exclude coronary artery disease (2). Sometimes patients with other cardiovascular comorbidities (arterial hypertension, coronary artery disease or cardiomyopathies) can also suffer from myocarditis which means they need more investigations, sometimes including EMB to be able to clarify the diagnosis. Based on a consensus of experts (2), there are fi rst-line tests recommended for patients whose symptomology is consistent with myocarditis. 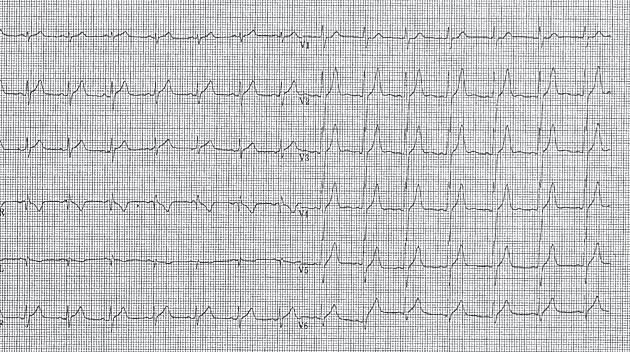 The first among these is the ECG, which may be normal or with non-specific abnormalities (7,8). Findings may include ST changes, diff erent types of arrhythmias (atrial and ventricular premature beats, atrial fibrillation, non-sustained ventricular tachycardia, AV block). ST segment elevation in myocarditis is typically concave (while in myocardial infarction it is convex) and diffuse without reciprocal changes. Our patient did not present with evolutive ECG changes, and his ECG pattern was also possibly suggestive of acute ischemia (tall symmetric T waves). Secondly, echocardiography is a very useful method for detecting impairment of ventricular function (9,10). Other findings include LV dilatation, changes in LV geometry, diastolic dysfunction, wall motion abnormalities and pericardial effusion. Myocarditis can mimic the echographic aspect of different types of cardiomyopathies or coronary artery disease11. Except for a small pericardial effusion, no changes in conventional echocardiography were found in our patient. Last but defi nitely not least, CMR provides the unique ability of non-invasive tissue characterization of the myocardium, which could suggest myocarditis: inflammatory hyperemia and edema, myocite necrosis and scars, changes in ventricular size and geometry, global and regional wall motion abnormalities, pericardial effusion (12,13). The International Consensus Group on CMR Diagnosis of Myocarditis published a list of recommendations based on preclinical and clinical investigations (Table 2). Specific CMR changes were found in our patient contributing to the final diagnosis or myocarditis. Finally, radionuclide ventriculography is useful only when echocardiography images are suboptimal and cardiac MRI is unavailable. To conclude, in stable patients, CMR is highly recommended, while in patients with life-threatening conditions, EMB should be performed urgently (14,15). 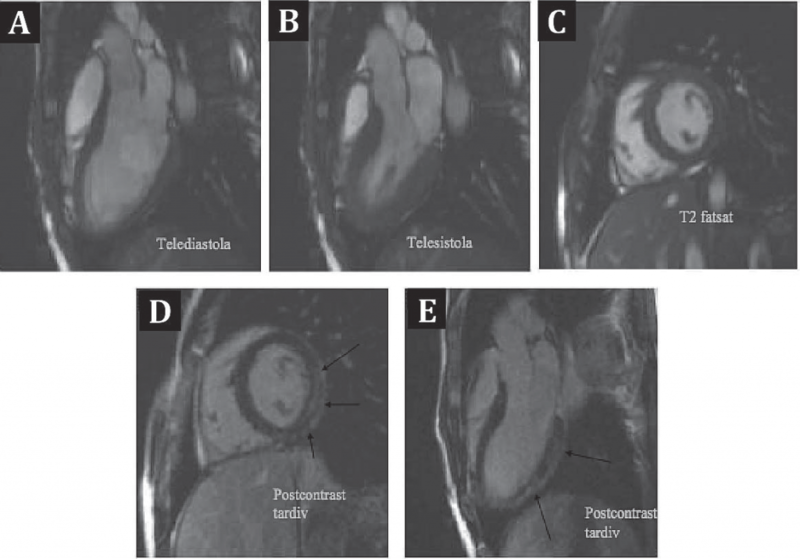 1) Regional or global myocardial signal increase in T2- weighted edema imagesa. 2) Increased global myocardial early gadolinium enhancement ration between myocardium and skeletal muscle in gadolinium-enhanced T1-weighted images B. 3)There is at least one focal lesion with non-ischemic regional distribution or inversion recovery-prepared gadolinium-enhanced T1-weighted images (late gadolinium enhancement) C.
A CMR study is consistent with myocyte injury and/or scar caused by myocardial inflammation if Criterion 3 is present. None of the criteria are present, but the onset of symptoms has been very recent and there is strong clinical evidence for myocardial inflammation. One of the criteria is present. The presence of LV dysfunction or pericardial effusion provides additional, supportive for myocarditis. a Global signal intensity (SI) increase has to be quantified by an SI ratio of myocardium over skeletal muscle of ≥2.0. If the edema is more subendocardial or transmural in combination with a colocalized ischemic (including the subendocardial layer) pattern of late gadolinium engancement, acute myocardial infarction is more likely and should be reported. b A global SI enhancement ratio of myocardium over skeletal muscle of ≥4.0 or an absolute myocardial enhancement of ≥45% is consistent with myocarditis. c Images should be obtained at least 5 min after gadolinium injection; foci typically exclude the subendocardial layer, are often multifocal and involve the subepicardium. If the late gadolinium enhancement pattern clearly indicates myocardial infarction and is colocalized with a transmural regional edema, acute myocardial infarction is more likely and should be reported. Delayed contrast enhancement following gadolinium-diethylenetriaminepentaacetic acid (DTPA) infusion. Presence of viral genome by PCR or in situ hybridization. Erythrocite sedimentation rates and C-reactive protein levels are oft en increased in myocarditis as a result of inflammation. On the other hand,a normal troponin valuedoes not exclude miocarditis even if troponin levels are sensitive to myocyte injury (16,17). It should also be mentioned that in case myocarditis leads to heart failure BNP and NTproBNP are found to be high. Even though viruses are the most common causefor myocarditis, viral antibodies as well as serum cardiac autoantibodies have been found to have limited utility in the diagnosic process. The particularity of the present case consists in the presence of myocardial bridging with severe systolic compression in a young patient with myocarditis. The major coronary arteries which normally are distributed over the epicardial surface of the heart, occasionally grow intramurally through the myocardium. During the systolic phase the intramural segment is compressed realizing systolic myocardial bridging (26,27). Even though, myocardial bridging was fi rst identified as early as 1737, it was first described angiographically in 196027. The estimated frequency of this congenital abnormality has a large variation, ranging between 1.6- 16% when assessed by coronary angiography (28). Even if all major epicardial coronary arteries could be affected, the most prevalent is the LAD. Bridges have been classified as deep or superficial based on the thickness of the overlying myocardium and on the type of myocardial fibers they consist of: ones that only traverse over the coronary segment and ones that encircle it. The hemodynamic impact is influenced by these factors as well as the length of the bridge and the presence of adipose and connective tissue surrounding the segment (50). Myocardial bridging is generally a benign condition but it could have complications such as ischemia and acute coronary syndrome, coronary spasms, ventricular septal rupture, arrhythmias, transitory ventricular dysfunction, and even sudden death (29-31). Despite it being an inborn condition, symptoms appear usually in the third decade of life. While case presentations are frequent in the literature, no big studies or case-series really reflect the prevalence of associated complications. Myocardial bridging can be suspected in patients with angina without existing risk factors or evidence of ischemia (32). Myocardial bridging may be associated up to 30 % with hypertrophic cardiomyopathy and is a risk factor for cardiac complications in this disease (39). The diagnosis can be based on both noninvasive and invasive techniques. Noninvasive imaging has been used for diagnosis and evaluation the ischemic impact: multiple-slice computed tomography shows myocardium surrounding the coronary segment, with recent developments on this method, allows for physiological analysis as well; stress single-photon emission computed tomography can related the ischemic impact to the degree of coronary narrowing (46,47); while stress echocardiography is the most readily available noninvasive technique, it is not well validated (48). Angiographic diagnosis is based on a change in diameter of more than 70% during systole, creating a significant “milking effect”. In addition to regular angiography, other invasive methods can help with evaluating the impact and pathophysiology of the myocardial bridge. Intravascular ultrasound may show the “halfmoon” sign, which is a hyperechogenic area between the coronary segment and the epicardium and can also characterize proximal minimal atherosclerosis, which cannot be detected during angiography (49). Intracoronary Doppler and pressure measurement (with pharmacological infusion) aids in the evaluation of the endothelial dysfunction, the proximal plaque and the level of vasospasm involved, while stimulating myocardial obstruction (50). Myocardial bridging causes coronary artery obstruction only during the systole and it does not significantly influence myocardial perfusion since two thirds of the perfusion occurs during diastole. In situations of persistent narrowing in early diastole (in severe bridging or in tachycardia) myocardial ischemia could be detected. The relationship between atherosclerosis and myocardial bridging also represents an interesting topic. It has been proven that the intima of tunneled arteries is considerably thinner than the intima of the proximal segment (33). From a histological point of view the intima beneath the bridge consists only of contractile type smooth cells and interstitial collagen without synthetic type smooth cells (34). These changes indicate protection against atherosclerosis progression, since there is a lack of synthetic type smooth cells which normally proliferate and produce collagen fibrils and elastic fibers (35). Another notable fact is that at the bridging level there is a decreased expression of vasoactive agents, such asendothelial nitric oxide synthetase (eNOS), endothelin 1, angiotensin converting enzyme (36). However, using IVUS some researchers have reported increased atherosclerotic plaques proximal of the bridging (37,38). The evaluation of the ischemic impact of myocardial bridging in our patient was performed by echographic stress test, which was negative which suggests that the myocardial bridge does not have a significant functional impact. A study by Escaned et al compared mean diastolic fractional flow reserve (FFR) with and without dobutamin inotropic stimulation in myocardial bridging. The reported data suggested that the functional severity of some myocardial bridges is only established after inotropic stress (45). For the treatment of angina produced by myocardial bridging, beta-blockers and nondihydropyridine calcium channel blockers may be valuable options through their action to reduce heart rate and myocardial contractility (27). Calcium blockers may be more benefi cial in patients who associate signifi cant vasospasm (though there are no randomized studies comparing the two). Also worth taking into consideration is the introduction of antiplatelet therapy, because of the increased risk of atherosclerosis and endothelial cell instability right before the start of the bridged segment, especially if subclinical atherosclerosis has been demonstrated through advanced imaging techniques (described above). Nitrates are contraindicated because of their contractility sympathetic stimulation. Even though preliminary data suggest that stents may normalize coronary distortions and improve clinical symptoms, there are relatively higher rates of target lesions revascularization and complications such as coronary artery perforation or stent fracture (40-42). Tsujita et al. in a study on 70 patients with symptomatic myocardial bridging, who had percutaneous angioplasty mostly with drug eluting-stents, showed a need for target-lesion revascularization of 24% in patients with myocardial bridging, compared to 4% in patients with stents for epicardial obstructive lesions. Another study on 11 patients43 showed that bare-metal stent implantation has a higher risk of intra-stent stenosis, with 4 pts having to undergo revascularization procedures during follow up, which is comparable to lesions of 25 mm length in coronary artery disease. Surgical therapy with dissection of overlying myocardium is indicated for patients with persistent symptoms despite medical treatment. The optimal surgical treatment is represented by the disection of the overlying myocardium with the complete exposure of the coronary artery. Th is is sometimes also accompanied by by-pass graft . A small study showed good clinical results, but also reported serious complications such as ventricular aneurysm andventricularperforation (44). The Schwarz classification for myocardial bridges and treatment suggests no treatment for an incidentally discovered bridge (type A), treatment with betablockers or calcium blockers for positive stress tests (type B), and possible invasive treatment (surgical or inter ventional) for patients with altered intracoronary hemodynamics measured by advanced imaging methods50. For our patient, the preferred treatment was betablockers for now even though echographic stress test results were negative for ischemia. This decision was taken because, in a young man with possible interest for exercise and an active life, myocardial ischemia can be exacerbated by the myocardial bridge. This is a case which reflects very well the diagnostic difficulties which doctorscan face. Myocarditis can many times have clinical manifestations and laboratory workup similar to acute coronary syndrome which should always lead to excluding coronary artery diseasefor a final diagnosis of myocarditis. Even though it is not an uncommon finding, there are no large studies regarding the therapy of myocardial bridging. This paucity of medical data makes it hard to decide on treatment if the bridge provokes severe stenosis and becomessymptomatic. The case shows the importance of following through with a full set of investigations even after a potential diagnosis is reached, allowing a correct final diagnosis and a proper management. 1. Richardson P, McKenna W, Bristow M, et al. Report of the 1995 World Health Organization/International Society and Federation of Cardiology Task Force on the Defi nition and Classifi cation of cardiomyopathies. Circulation 1996; 93:841. 2. Caforio AL, Pankuweit S, Arbustini E, et al. Current state of knowledge on aetiology, diagnosis, management, and therapy of myocarditis: a position statement of the European Society of Cardiology Working Group on Myocardial and Pericardial Diseases. Eur Heart J 2013; 34:2636. 3. Mahrholdt H, Wagner A, Deluigi CC, et al. Presentation, patterns of myocardial damage, and clinical course of viral myocarditis. Circulation 2006; 114:1581. 4. O’Connell JB. Diagnosis and medical treatment of infl ammatory cardiomyopathy. In: Cardiovascular Medicine, Topol E, Nissen J (Eds), Lippincott-Raven, Philadelphia 1998. 5. Dec GW Jr, Palacios IF, Fallon JT, et al. Active myocarditis in the spectrum of acute dilated cardiomyopathies. Clinical features, histologic correlates, and clinical outcome. N Engl J Med 1985; 312:885. 6. O’Connell JB, Mason JW. Diagnosing and treating active myocarditis. West J Med 1989; 150:431. 7. UkenaC, Mahfoud F, Kindermann I, et al. Prognostic electrocardiographic parameters in patients with suspected myocarditis. Eur J Heart Fail 2011;13:398–405. 8. Caforio AL, Calabrese F, Angelini A, et al. A prospective study of biopsy proven myocarditis: prognostic relevance of clinical and aetiopathogenetic features at diagnosis. Eur Heart J 2007;28:1326–1333. 9. Nieminen MS, Heikkilä J, Karjalainen J. Echocardiography in acute infectious myocarditis: relation to clinical and electrocardiographic findings. Am J Cardiol1984; 53:1331. 10. Pinamonti B, Alberti E, Cigalotto A, et al. Echocardiographic findings in myocarditis. Am J Cardiol1988; 62:285. 11. Yilmaz A, Klingel K, Kandolf R, Sechtem U. Imaging in inflammatory heart disease: from the past to current clinical practice. Hellenic J Cardiol 2009;50:449–460. 12. Friedrich MG, Sechtem U, Schulz-Menger J, et al. Cardiovascular magnetic resonance in myocarditis: A JACC White Paper. J Am Coll Cardiol 2009; 53:1475. 13. Friedrich MG, Marcotte F. Cardiac magnetic resonance assessment of myocarditis. CircCardiovasc Imaging 2013; 6:833. 14. Cooper LT, Baughman KL, Feldman AM, et al. The role of endomyocardial biopsy in the management of cardiovascular disease: a scientific statement from the American Heart Association, the American College of Cardiology, and the European Society of Cardiology. J Am CollCardiol 2007;50:1914–1931. 15. Yilmaz A, Kindermann I, Kindermann M, et al. Comparative evaluation of left and right ventricular endomyocardial biopsy: differences in complication rate and diagnostic performance. Circulation 2010;122: 900 – 909. 16. Smith SC, Ladenson JH, Mason JW, Jaff e AS. Elevations of cardiac troponin I associated with myocarditis. Experimental and clinical correlates. Circulation 1997; 95:163. 17. Lauer B, Niederau C, Kühl U, et al. Cardiac troponin T in patients with clinically suspected myocarditis. J Am CollCardiol 1997; 30:1354. 18. Japanese Circulation Society (JCS) Joint Working Group. Guidelines for diagnosis and treatment of myocarditis (JCS 2009). Circ J 2011;75:734–743. 19. Mirabel M, Luyt CE, Leprince P, et al. Outcomes, long-term quality of life, and psychologic assessment of fulminant myo- carditis patients rescued by mechanical circulatory support. Crit Care Med 2011;39: 1029 – 1035. 20. McMurray JJ, Adamopoulos S, Anker SD, et al. ESC guidelines for the diagnosis and treatment of acute and chronic heart failure 2012: the Task Force for the diagnosis and treatment of acute and chronic heart failure 2012 of the European Society of Cardiology.Eur Heart J 2012; 33:1787-1847. 21. Zipes DP, Camm AJ, Borggrefe M, et al. ACC/AHA/ESC 2006 guidelines for management of patients with ventricular arrhythmias and the prevention of sudden cardiac death—executive summary. Eur Heart J 2006;27: 2099–2140. 22. Mason JW, O’Connell JB, Herskowitz A, Rose NR, McManus BM, Billingham ME, Moon TE. A clinical trial of immunosuppressive therapy for myocarditis: Th e Myocarditis Treatment Trial Investigators. N Engl J Med 1995;333:269–275. 23. Martino TA, Liu P, Sole MJ. Viral infection and the pathogenesis of dilated cardiomyopathy. Circ Res 1994;74:182–188. 24. Orange JS, Hossny EM, Weiler CR, et al. Primary Immunodeficiency Committee of the American Academy of Allergy, Asthma and Immu nology. Use of intravenous immunoglobulin in human disease: a review of evidence by members of the Primary Immunodeficiency Committee of the American Academy of Allergy, Asthma and Immunology. J Allergy ClinImmunol 2006;117(4 suppl):S525–S553. 25. Kindermann I, Barth C, Mahfoud F, et al. Update on myocarditis. J Am CollCardiol 2012;59:779–792. 26. Angelini P, Velasco JA, Flamm S. Coronary anomalies: incidence, pathophysiology, and clinical relevance. Circulation 2002;105: 2449–2454. 27. Alegria JR, Herrmann J, Holmes DR Jr, et al. Myocardial bridging. Eur Heart J 2005; 26:1159. 28. Rossi L, Dander B, Nidasio GP, Arbustini E, Paris B, Vassanelli C et al. Myocardial bridges and ischemic heart disease. Eur Heart J 1980;1:239–245. 29. Tauth J, Sullebarger T. Myocardial infarction associated with myocardial bridging: case history and review of the literature. Cathet Cardiovasc Diagn 1997;40:364–367. 30. Arjomand H, AlSalman J, Azain J, Amin D. Myocardial bridging of left circumfl ex coronary artery associated with acute myocardial infarction. J Invasive Cardiol 2000;12:431–434. 31. Pittaluga J, de Marchena E, Posada JD, Romanelli R, Morales A. Left anterior descending coronary artery bridge: a cause of early death after cardiac transplantation. Chest 1997;111:511–513. 32. Lee YS, Moon DH, Shin JW, Park SW, Park SJ, Lee HK. Dipyridamole TI-201 SPECT imaging in patients with myocardial bridging. ClinNucl Med 1999;24:759–764. 33. Risse M, Weiler G. Coronary muscle bridge and its relations to local coronary sclerosis, regional myocardial ischemia and coronary spasm: a morphometric study. Z Kardiol 1985; 74:700–705. 34. Masuda T, Ishikawa Y, Akasaka Y, Itoh K, Kiguchi H, Ishii T. The effect of myocardial bridging of the coronary artery on vasoactive agents and atherosclerosis localization. J Pathol 2001;193:408–414. 35. Ishii T, Asuwa N, Masuda S, Ishikawa Y, Kiguchi H, Shimada K. Atherosclerosis suppression in the left anterior descending coronary artery by the presence of a myocardial bridge: an ultrastructural study. Mod Pathol 1991;4:424–431. 36. Ihling C, Szombathy T, Bohrmann B, Brockhaus M, Schaefer HE, Loeffl er BM. Coexpression of endothelin-converting enzyme-1 and endothelin-1 in different stages of human atherosclerosis. Circulation 2001;104:864–869. 37. Ishikawa Y, Akasaka Y, Suzuki K, et al. Anatomic properties of myocardial bridge predisposing to myocardial infarction. Circulation 2009; 120:376. 38. Ge J, Erbel R, Rupprecht HJ, et al. Comparison of intravascular ultrasound and angiography in the assessment of myocardial bridging. Circulation 1994; 89:1725. 39. Mohiddin SA, Begley D, Shih J, Fananapazir L. Myocardial bridging does not predict sudden death in children with hypertrophic cardiomyopathy but is associated with more severe cardiac disease. J Am CollCardiol2000; 36:2270. 40. Tsujita K, Maehara A, Mintz GS, et al. Impact of myocardial bridge on clinical outcome aft er coronary stent placement. Am J Cardiol2009; 103:1344. 41. Klues HG, Schwarz ER, vom Dahl J, et al. Disturbed intracoronary hemodynamics in myocardial bridging: early normalization by intracoronary stent placement. Circulation 1997; 96:2905. 42. Prendergast BD, Kerr F, Starkey IR. Normalisation of abnormal coronary fractional fl ow reserve associated with myocardial bridging using an intracoronary stent. Heart 2000; 83:705. 43. Haager PK, Schwarz ER, vom Dahl J, Klues HG, Reff elmannT,Hanrath P. Long term angiographic and clinical follow up in patientswith stent implantation for symptomatic myocardial bridging. Heart2000;84:403–408. 44. Iversen S, Hake U, Mayer E, Erbel R, Diefenbach C, Oelert H. Surgicaltreatment of myocardial bridging causing coronary artery obstruction. Scand J Th oracCardiovascSurg 1992;26:107–111. 45. Escaned J, Cortes J, Flores A, Goicolea J, Alfonso F, Hernandez Ret al. Importance of diastolic fractional flow reserve and dobutamine challenge in physiologic assessment of myocardial bridging.J Am Coll- Cardiol2003;42:226–233. 46. Gawor R., Kusmie ek J., Plachcinski A., et al; Myocardial perfusion SECT imaging in patients with myocardial bridging. J Nucl Cardiol. 2011;18:1059-1065. 47. Galbraith E.M., Eshtehardi P., Samady H.; SPECT perfusion imaging and myocardial bridges: bridging the gap of diagnostic uncertainty. J NuclCardiol. 2011;18:1000-1002. 49. Ge J, Jeremias A, Rupp A, et al; New signs characteristic of myocardial bridging demonstrated by intracoronary ultrasound and Doppler. Eur Heart J. 1999;20:1707-1716. 50. Michel T. Corban; Olivia Y. Hung; Parham Eshtehardi, Myocardial Bridging Contemporary Understanding of Pathophysiology With Implications for Diagnostic and Th erapeutic Strategies, JACC Vol. 63, No. 22, 2014. June 10, 2014:2346–55.